I’m so happy she’s done. My favorite part of the whole process is searching in my stash for just the right yarns in just the right colors. I feel a sense of victory when I don’t have to run out and buy more yarn. With yarns and hooks in hand, I started on my adventure. Once I finished my Elsa doll, everyone asked me where the Anna doll was. I put it off for a bit but I started working on her yesterday. I’m off from work for the summer so I have a little more time on my hands. That’s how I was able to finish the dog sweater and that’s how I’ve been able to work on Anna. Now that I have some free time, I’m trying to catch up on all those little things I never have time for, like cleaning out my hall closet. A task I’ve been trying to get to for months. Steaming cleaning my carpet is a task I’ve been telling myself I would take care of in the summer. Deep cleaning my house, organizing my computer files, writing my blog :-), finish editing my book, set up my Etsy shop, create things for an Etsy shop, blah, blah, blah. So far I’ve done laundry, read some books, finished a dog sweater (which I’m happy about) and started the Anna doll. Not too bad but not so great either. Now that I have more time, I feel like I don’t want to do anything. I gave myself a break by telling myself that it was fine to be lazy my first week off from work. I spent a whole day and part of the next making that sweater while watching my stories. I was so conflicted! On the one hand, I was ‘working’ on a creation that hones my craft but on the other hand I was watching TV all day while making it. Then I started on Anna and told myself I would only work on her for a few hours and ended up working on her all day too! Oh well 🙂 It was my lazy week so that makes it fine, I just have to run around the block a few times to shake off the atrophy that settled in. lol. I finished the doll head and it turned out smaller than the Elsa doll. Not a problem since she’s her ‘little’ sister. I went looking in my stash for the perfect yarn for her hair and found something I liked. It’s Patons Metallic yarn in copper. I bought three skeins of this yarn in different colors because it looked and felt so pretty. It has a nice, shiny, metallic look to it. I didn’t know what I was going to do with it when I bought it but I couldn’t pass it up since I had a 50% off coupon. 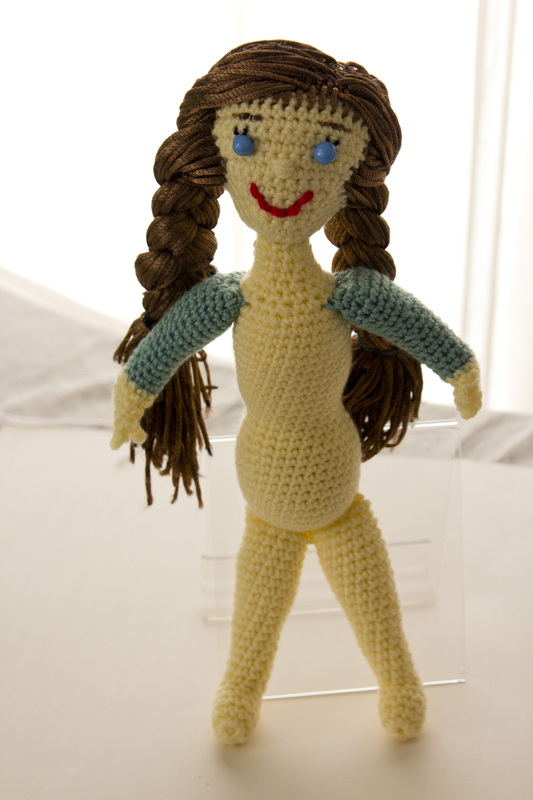 Normally I make the body parts first, assemble the doll and then make the hair but I couldn’t wait. I did make the torso and attached it so I had a reference for the length of the hair. I loved the feel of the yarn and wanted to get started right away. I cut it into long strands and realized something was wrong. I’m no expert in yarn properties and the yarn wasn’t turning out like I thought it would. I cut the yarn into strands and noticed these little copper flecks all over me and where the yarn was cut, there was black wool sticking out and sometimes falling off. The ends of each cut strand were going to be a problem. I was already committed so I hoped for the best and started attaching the hair. That’s when I discovered the yarn required that I use a lot of it in order to look good. That meant it would be more time-consuming to attach. When I was done, I was covered in copper particles but the doll looked good so it wasn’t a total loss. I’m just concerned that over time the ends of hair will continue to fray. It snags quite easily too. 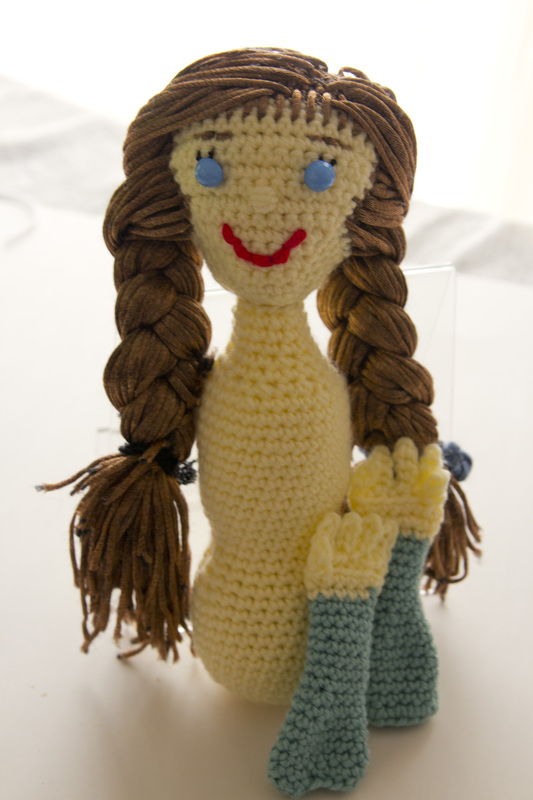 I still love the yarn but I now know it’s definitely not good for doll hair, at least not the way I use it. I started making the arms and realized that Anna’s dress has a blue sweater/shirt underneath so I changed gears and decided to make the arms in blue instead of making a separate shirt. I wish I had made the top part of the body in blue but now I need to make a separate piece for the undershirt for the torso part. I’ve seen what others have done for the dress and they are amazing. Hopefully I can meet the challenge. 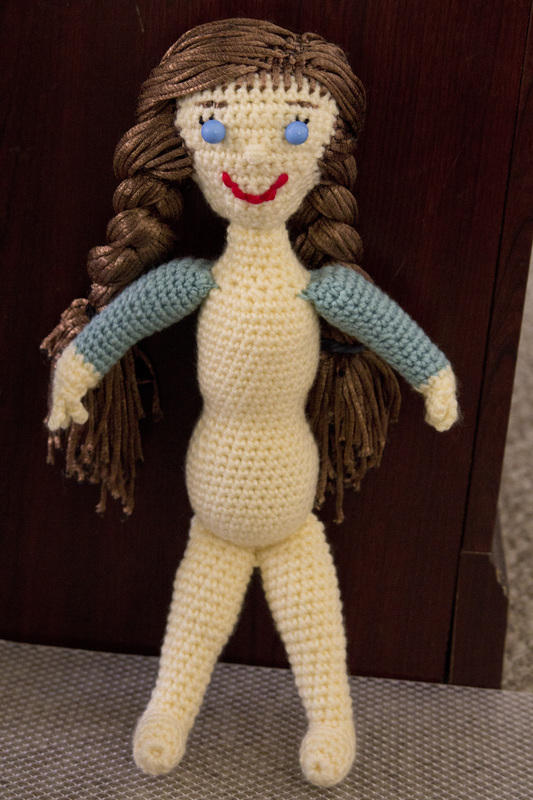 So I finished making my sister’s baby doll. 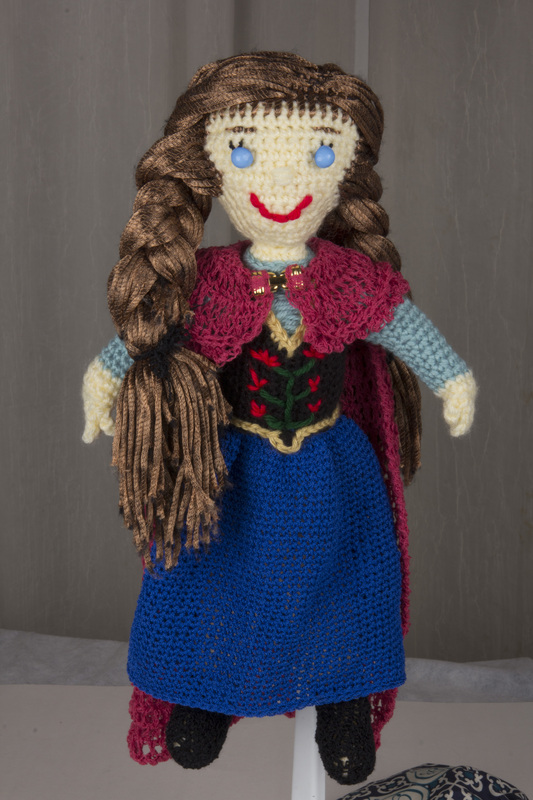 I promised I’d make one for her and then made the Elsa doll instead. There is a bright side to waiting, though (at least that’s what I keep telling her). I practiced some techniques on Elsa that helped me with this doll. I’m getting better at making fingers, for one, and I tried my hand at color work instead of a hair cap for another. I’m so glad I’m steadily crossing off projects from my to-do list. 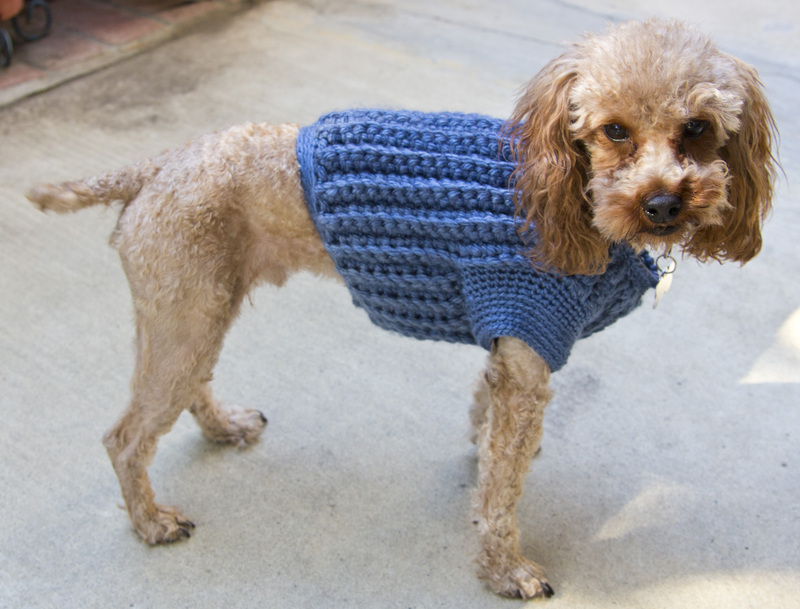 I just finished that doggie sweater I promised my daughter ages ago. 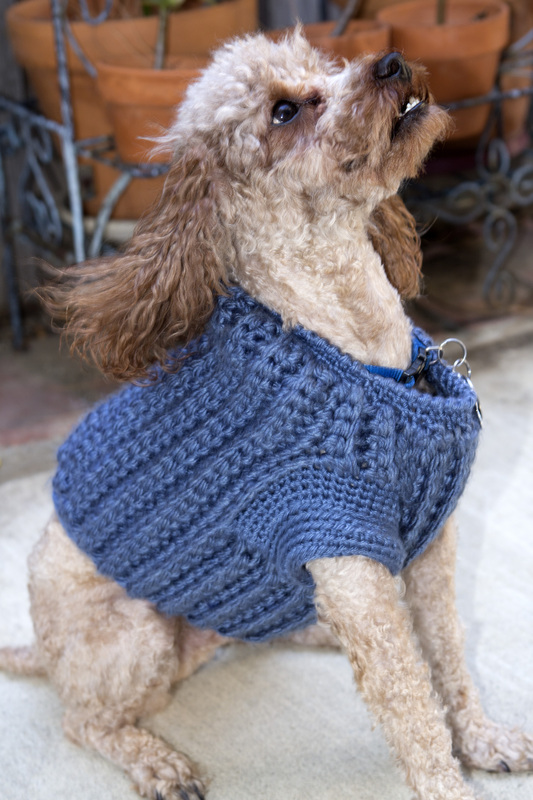 It’s the first one I’ve ever made and I used one of her doggie’s favorite sweaters as a guide. I started and ripped back about five different times. I tried different ways to make it work until I arrived at something I thought might work. I’m not very happy with the end result. It came out a little off but I guess that’s to be expected on a first attempt (although I’m not sure I’m going for a second attempt). I’ll probably try a pattern next time (if there is a next time). It came out a little bulkier than I had hoped. We tried it on her pup and at first he seemed reluctant to move. I think it was too heavy. Eventually he seemed comfortable moving around in it. If I do make another one, I need to make a few adjustments. The middle part of the chest area needs fewer rows. The length of the back area behind the the neck needs to be shorter and I definitely need to use a thinner yarn that drapes better. For this sweater, I was just trying to work out the mechanics of it. In future sweaters (if there are any), I would like to try different designs and color combinations. Well, I guess it sounds like I’m going to try it again. I hate feeling like the project was a fail. The only way to get rid of that feeling is to make one that turns out right. 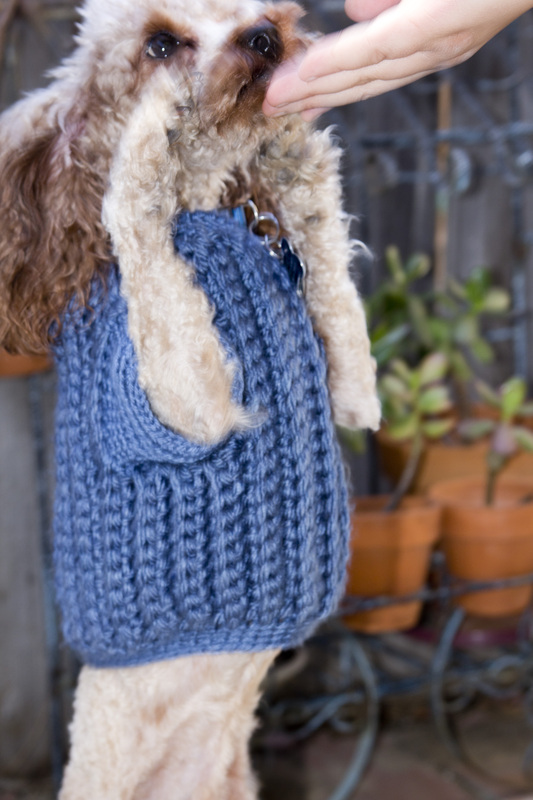 Her dog is going to end up with 50 sweaters. LOL!